Also referred to as a Double Needle. 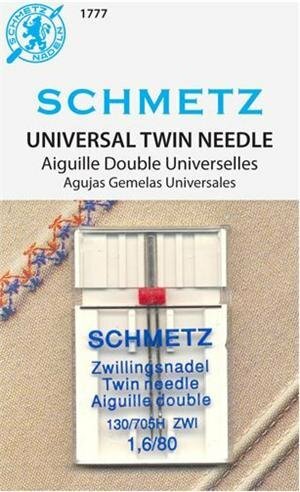 With narrowly spaced needles, this Universal Twin Needle is perfect for sewing dual rows of stitches stitches. Can be used with zig zag machines that thread front to back. System: 130705 H ZWI. Needle Distance: 1.6mm. Needle Size: 1280. 1 needle per pack. Carded.